With our years of experience and knowledge, we are engaged in offering a wide gamut of Process Reactors. The offered process reactors are used for commercial production applications. These process reactors are provided in numerous specifications as per the need of customers. Our offered Process reactors are precisely manufactured using superior quality material at vendor’s end keeping in mind the market standards. Customers can avail these process reactors from us at competitive rates in a committed time frame. 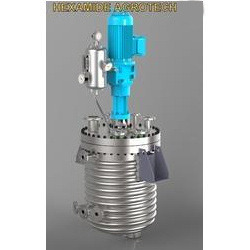 Established in the year 1999, Hexamide Agrotech Inc., is a renowned wholesaler of precision engineered Chemical Machinery. We are emerging as a fastest growing leader of machinery products including Reactors, Chemical Reactors and Process Reactors. In addition to this, we as a service provider of used machinery items offer equipment removal services, sale of equipments or plants, erection & commissioning of chemical plants and inventory services. In this competitive domain, we have a clear cut vision to provide our clients with remarkable products and services within the specified time frame. we export our products all over the world. We fabricate all the offered products as per the specific requirements of our valued clients based across the globe. With the exemplary guidance of our engineers, we have been able to achieve several benchmarks in the industry. Possessing over decades of experience in the domain, we assure qualitative products that carries attributes like durable finish, robust structure, high bearing strength, noiseless operations. Moreover, our skilled workers endeavor hard to fulfill each and every need of the buyers. To enable utmost client satisfaction, our quality team work strictly in adherence to the set industry norms while designing the range of machines.